10 Amp, five core, 3 Phase, “Construction” Extension Leads. The 10 Amp 5 core 3 phase “construction” lead has a larger diameter cable and longer maximum allowable length from the outlet to the appliance than heavy-duty leads. It is suitable for use on sites that have a few 3 phase outlets, or the lead is connected to a temporary site power board that is a long way from the local distribution board. Where voltage drop is a consideration (either the machine is a considerable distance from the main distribution board or has high starting current). 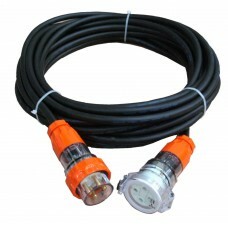 10A 5 Pin 3 Phase Australian Standard “Construction” Extension Lead Length: 10 m ..
10A 5 Pin 3 Phase Australian Standard “Construction” Extension Lead Length: 15 m ..
10A 5 Pin 3 Phase Australian Standard “Construction” Extension Lead Length: 20 m ..
10A 5 Pin 3 Phase Australian Standard “Construction” Extension Lead Length: 25 m ..
10A 5 Pin 3 Phase Australian Standard “Construction” Extension Lead Length: 30 m ..
10A 5 Pin 3 Phase Australian Standard “Construction” Extension Lead Length: 40 m ..
10A 5 Pin 3 Phase Australian Standard “Construction” Extension Lead Length: 50 m ..